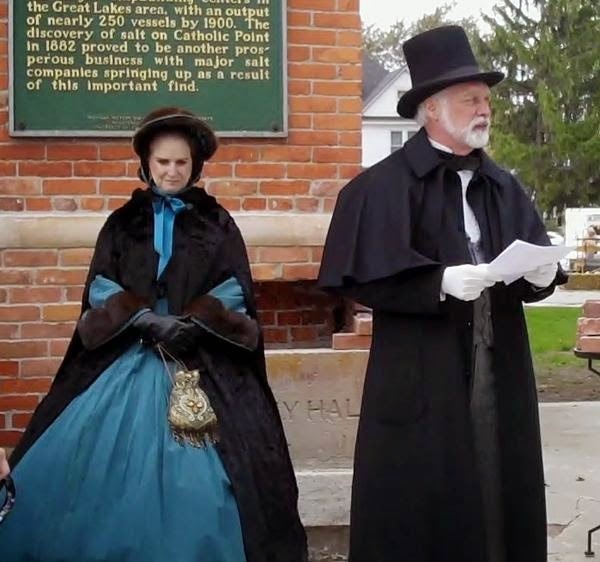 When doing Civil War reenactments as Liberetta Lerich Green, who grew up on a Utica, Michigan Underground Railroad Station and whose brothers were in the "Fighting Fifth" Infantry, I'd been wearing my Victorian mourning outfit, in honor of her late husband, Addison Green. 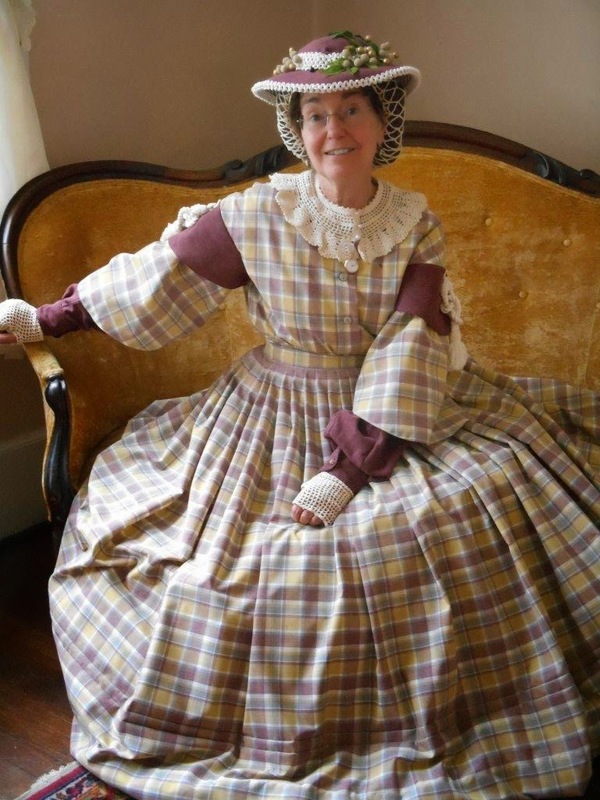 Now I will also offer Civil War period clothing thanks to Trish Moss who portrays Sarah Blair, the wife of Michigan's wartime governor. (Her husband, Carl, portrays Governor Austin Blair.) They're not officially online, but here's a video and article from The Voice of Carl dedicating the time capsule for Marine City's Heritage Days. Trish is far more lively than shows in the video, but as often happens with "First Ladies", was merely there in support of her husband. Here is at least a photo of them both. 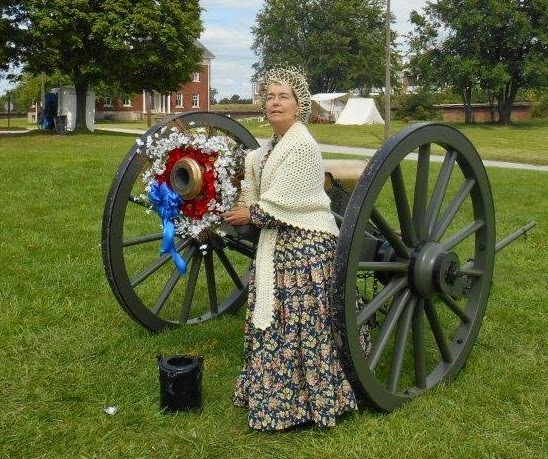 Like any reenactor I needed a story. Liberetta's oral history and other research I have done over the years didn't quite explain something I know would have concerned her abolitionist family . 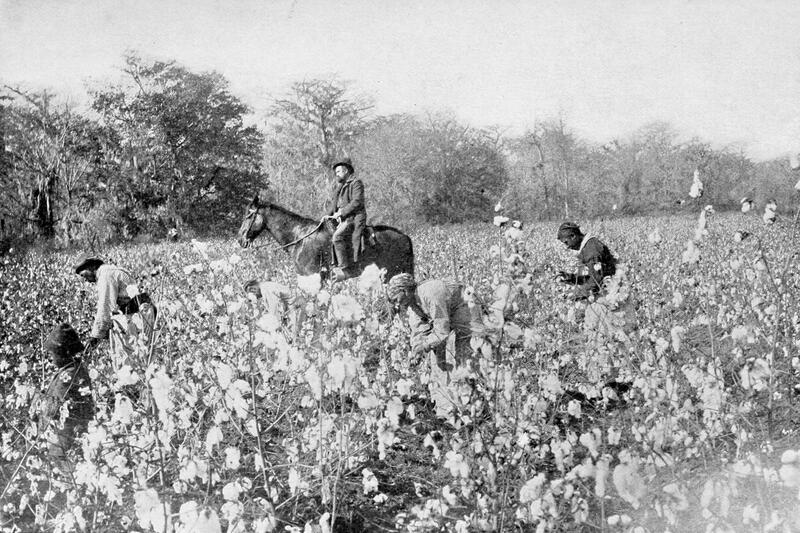 . . slave cotton. What's that? To understand the role of "King Cotton" in the Confederate States economy, this Wikipedia article summarizes how they hoped to use Lincoln's blockade to bring in European allies to their cause. The blockade was effective, while the attempt at "cotton diplomacy" by the south was not. Europe was determined to remain neutral and the Cotton Famine led them to switch to other sources. At the same time a boycott of slave-produced goods was controversial. No less a major abolitionist than William Lloyd Garrison switched from supporting the boycott to deciding it was unenforceable and a distraction. Many women, Quakers and African-American abolitionists disagreed. Professor Julie Holcomb's article, "Blood-Stained Goods" offers a good summary of "The Transatlantic Boycott of Slave Labor" and has contracted for a book-length explanation of Moral Commerce: The Transatlantic Boycott of Slave Labor. Did that mean northerners stopped wearing cotton? Dunberidiculous! 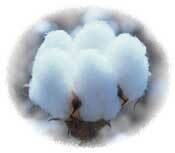 So where did Northerners get their cotton from during the Civil War? The South, of course. It seems that during the Civil War Lincoln promoted trade with the south, especially in raw cotton. He did so for several reasons. One was to keep northern weaving mills in operation. Second, Lincoln believed that many in the south sympathized with the Union and he wanted to ensure their loyalty. Third, he didn’t want the south trading the cotton that had supplied the north to England in exchange for guns and supplies. So a brisk trade in southern cotton carried on even though the South tried to stop it by burning much of the cotton crop of 1862. Unfortunately, other than allowing northerners to continue to wear cotton, it did not have all the results Lincoln hoped for. The traders, mostly Copperheads, were soon making magnificent profits trading guns and supplies for raw cotton, despite several efforts by the government to control the trade. To learn more of the ins and outs of this trade read David Surdam’s paper Traders or Traitors: Northern Cotton Trading during the Civil War and also Civil War Cotton Conspiracy. It's interesting that even Lincoln had second thoughts about the boycott of Slave Cotton. So here I am aware the Lerichs were fiercely inclined to follow their principles. Two examples Liberetta mentioned were salting a corn crop they sold, thus preventing its distillation into alcohol, and refusing to keep dogs because they were against hunting. Surely Slave Cotton would have been something they didn't purchase during the war and yet they, too, needed "Sunday-go-to-meeting" clothes. Fortunately during the war Liberetta was a young teenager, so it's understandable she probably wore hand-me-down dresses from her older sister, Cleantha, nearly 8 years her senior. Here are the wonderful outfits Trish Moss made. If you are interested in seeing what fabrics looked like during the Civil War, Reproduction Fabrics offers a page of swatches along with a link to a history of civil war fabrics. The look is certainly lovely, but it could also be said to be "striking" as a few women in an ordinary modern-sized room fill it when all wear hoops. While my ladies of long ago may tease today's women and girls by acting shocked that they wear "Trousers! ", isn't it great that we can? Mid-19th century women would have been fined for dressing like a man. 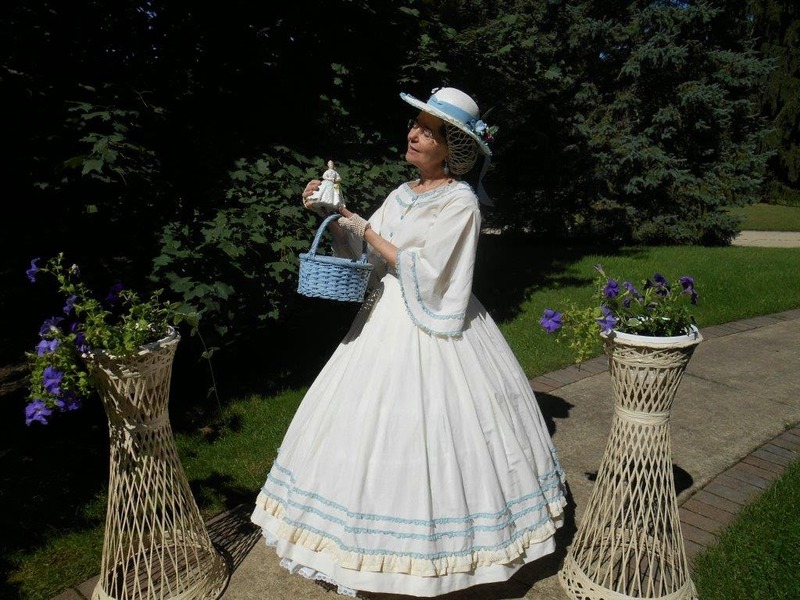 Amelia Bloomer was both a fashion revolutionary and crusaded for women's rights and temperance. Since Liberetta's mother also crusaded for the W.C.T.U. as well as being an abolitionist, surely she would have seen her family didn't wear Slave Cotton.